Once again, Patty-Cakes and Martha have been kind (foolish) enough to take in the poor, the sick, the huddled masses. Or, well…us. And by sick, I do mean SICK. For those who have not been following my Facebook rants, I am one of the latest victims of the norovirus plague. If you have not had this virus yet, immediately seal yourself in a plastic bubble and do not come out until it has vanished from the earth! Go! Now! What are you waiting for? For those infected who remain, let me tell you about the big thing I’ve been up to this year that has just recently come to an end. 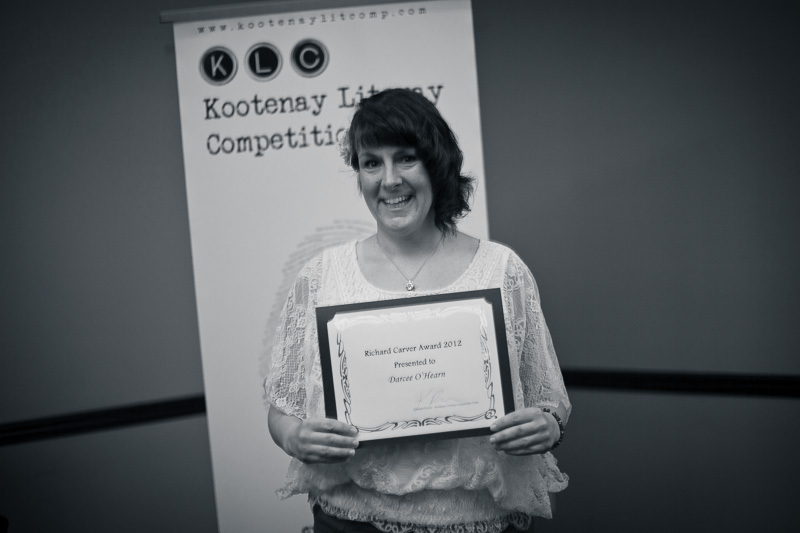 In 2009, I won second place in the Kootenay Literary Competition. 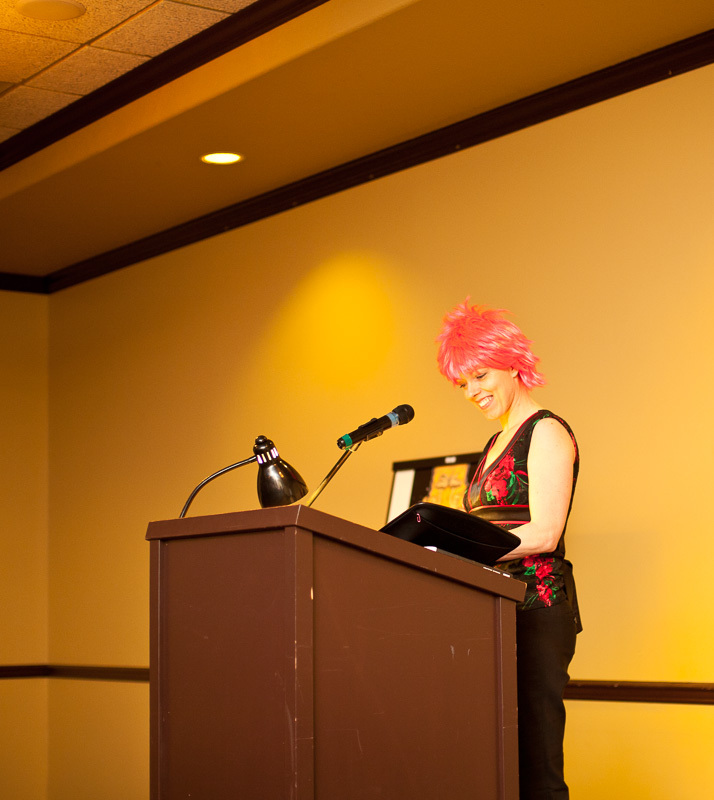 In 2010, I was asked to be a judge for the competition. In 2011, I was asked to join the organizing committee. And in 2012 I was asked to chair the committee. I ordinarily keep my distance from committees, volunteer or otherwise, because I know how much work they can entail, and I need to stay focused on Warpworld. This time, however, I felt I needed to step up. 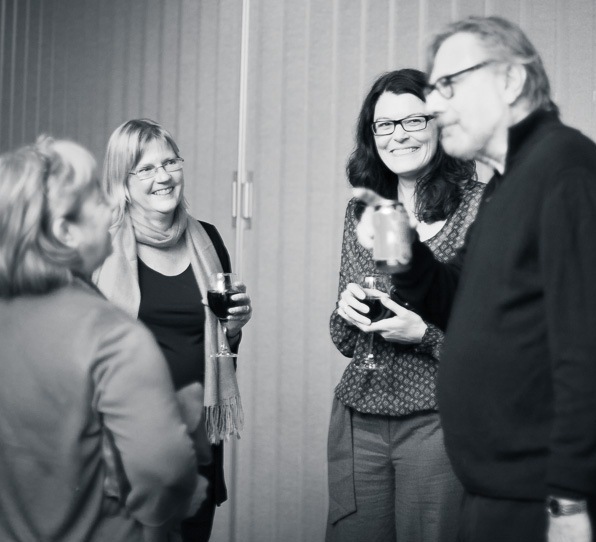 I have benefitted from the work of so many other volunteers in the literary community, especially in the Kootenays, how could I not give back? 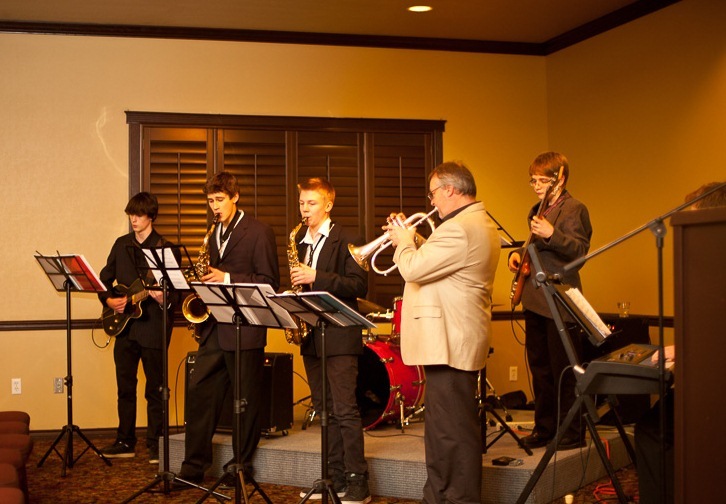 The LV Rogers Jazz Combo opens the evening! Despite a very long to-do list that never ever seemed to shrink, the pieces of this event fell into place. Big plans came together. Maybe with a few bumps and shudders, but they came together. 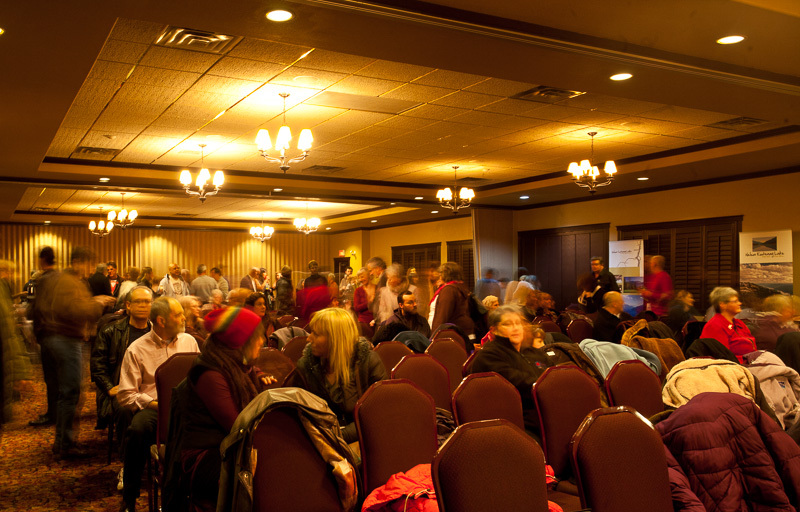 And on January 18th the Prestige Lakeside Resort in Nelson was the site of the Kootenay Literary Competition’s Awards Ceremony and Celebration! I hope we have enough cupcakes! Forget the cupcakes, I hope we have enough chairs! Shouts of “More chairs! We need more chairs!” went up and the Prestige’s crew (a million thanks to all of them) hustled to find seats for butts. 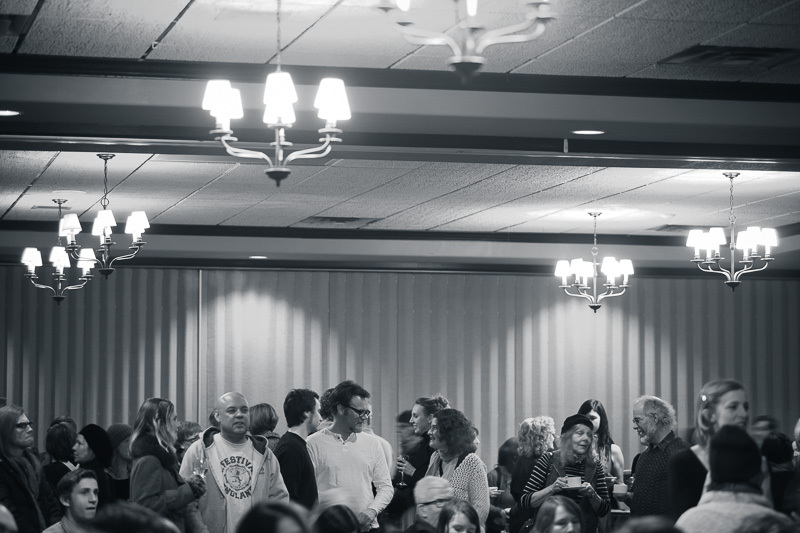 I think we ended up at 210 guests – but it’s all a blur. My mother used to cry when she saw my hair like this. First up at the lectern (not a podium, look it up in the dictionary or ask Anne DeGrace about the difference) was yours truly. You’ll notice my hair may look a bit pinker than usual. This was a nod to the younger, more colourful Princess, and to our young writers in the audience. With the obligatory but heartfelt thanks out of the way I wisely handed off the emcee job to Lucas Myers, Nelson’s Cultural Ambassador for the performing arts. What? You didn’t know a tiny mountain town could have a cultural ambassador? Well, you’ve obviously never been to Nelson. Lucas is very funny, by the way, and you should totally go see his upcoming one man show CROMOLI 4 SUPREME LEADER, and, no, he didn’t pay me to write that, but if he wants to he can reach me through this blog. I have a PayPal account. Just sayin’. Speaking of heartfelt thanks, I must pause here to give mine to Melissa of MelissaWelsh Photography. At the very last minute she donated her time and talents to come out and be our personal paparazzi and all the photos you see here are hers. Thanks Melissa! After Lucas explained to us how not to pronounce ‘gladiator’ (gla-die-a-tor is incorrect), he welcomed spoken word poet Sheri-D Wilson to the stage. Layin’ down the verbs, Sheri-D style! We flew Sheri-D in from Calgary on what I’ll call Murphy’s Law Airlines. One of our intrepid committee members, Wendyle, made a looooong drive to Cranbrook to fetch our headliner after the flight into nearby Castlegar was cancelled due to weather (we call it Cancel-gar for a reason apparently). Wendyle would make an even longer trek for the twice-cancelled return flight, and we all learned a valuable lesson about why it’s a bad idea to fly guests into Nelson in January. Anyway, schedule mishaps, cancelled flights, and pulled muscles aside, Sheri-D put on a hell of a show for the appreciative crowd. A crowd of over 200, did I mention? 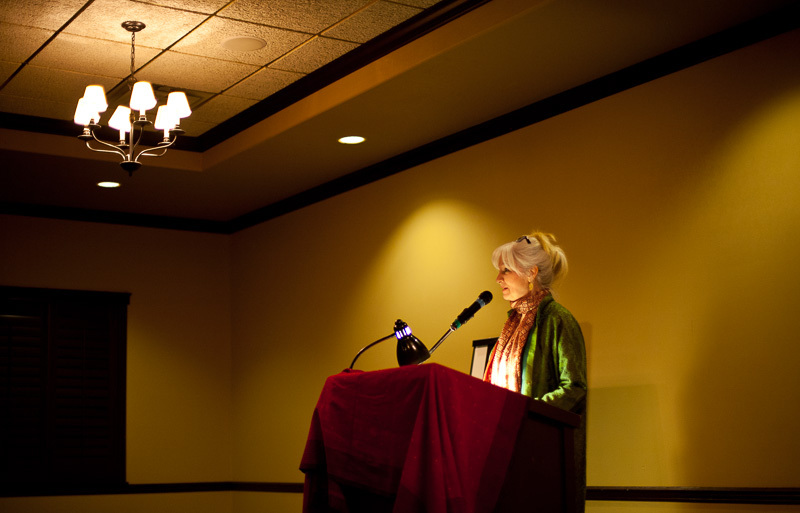 If you think you don’t like poetry, you haven’t seen Sheri-D perform. I will forever carry the image of her as a young woman with a table tied to her back engraved on my brain! Next up on the schedule were our young winners. I have to confess that seeing the young writers come out and get their awards is the #1 reason I took on this job. 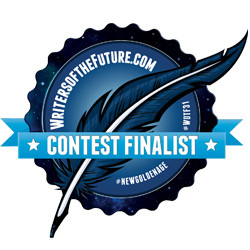 Who knows what their future will bring, but I nourish secret dreams that among the numbers might be one future novelist who will look back on this competition fondly or as, perhaps, the catalyst that convinced them to pursue their dream. Dream, young writers, dream big! This year we also had a new award for, ironically, a new writer. There was some behind-the-scenes chaos as we tried to figure out who should be eligible and how we would choose, and I gained enormous respect for any groups who have to do this on a regular basis, but eventually we had our winner and she fit perfectly. 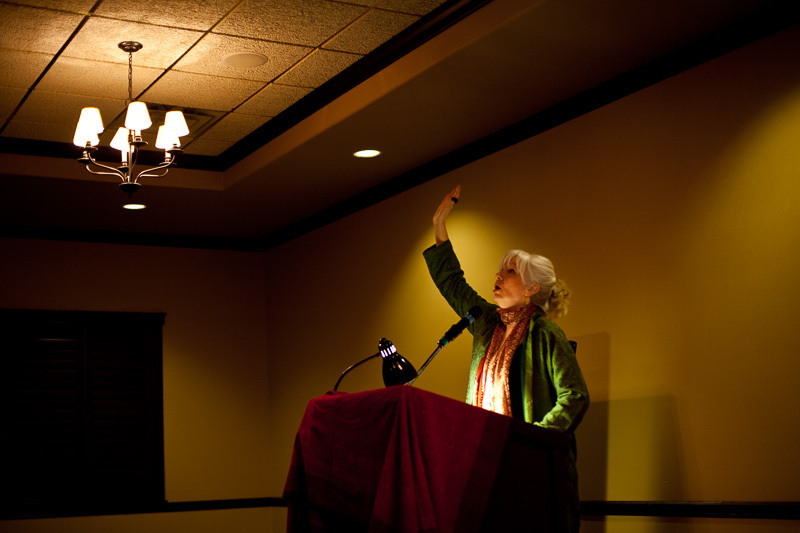 I don’t think there was a single happier human in that room, perhaps in all of Nelson, on January 18th, than Legends of the Forest author Darcee O’Hearn. The award was given in the name of Richard Carver. I never had the pleasure of meeting Richard but from all I learned in the research I did preparing for this award, I sure wish I had. Thankfully, I did get to meet his daughter, Jocelyn, who was an absolute sweetheart and whose impersonation of her father had the audience in stitches. Two special people. Anne DeGrace (left) and Jocelyn Carver (right). After that, it was on to the adults. 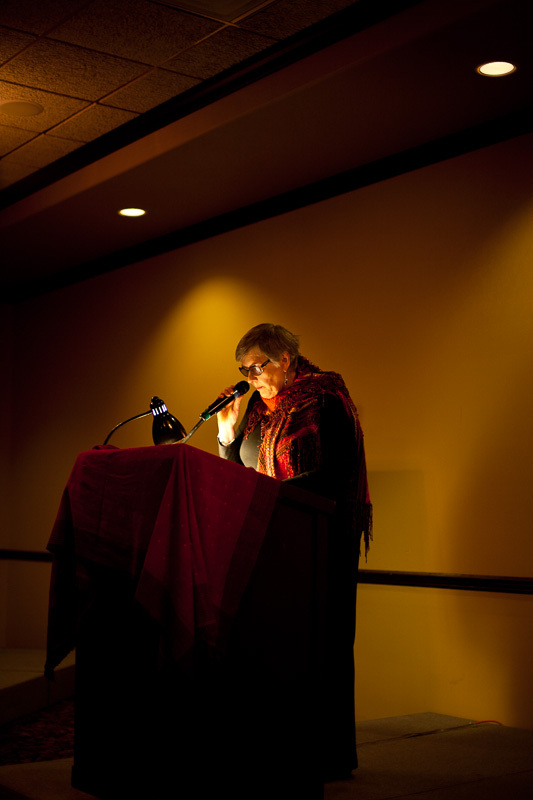 We had another fabulous array of winners this year, and it was very cool to hear from our non-fiction winner, Vera Maloff, about her Doukhobor heritage – the subject of her winning entry. 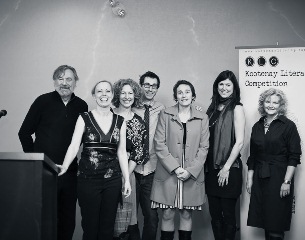 One of my favourite moments of the evening was the reading by our fiction winner, Beverly Rasporich. Each year, the adult competitors are given a theme and this year’s was “revolution”. I expected a lot of subject matter to come out of that prompt but I certainly didn’t foresee this hilarious tale of red-beret’d grannies plotting escape from an old folks home. At one point, I think I saw an entire row of people doubled over laughing. Great stuff. I could go on and on. 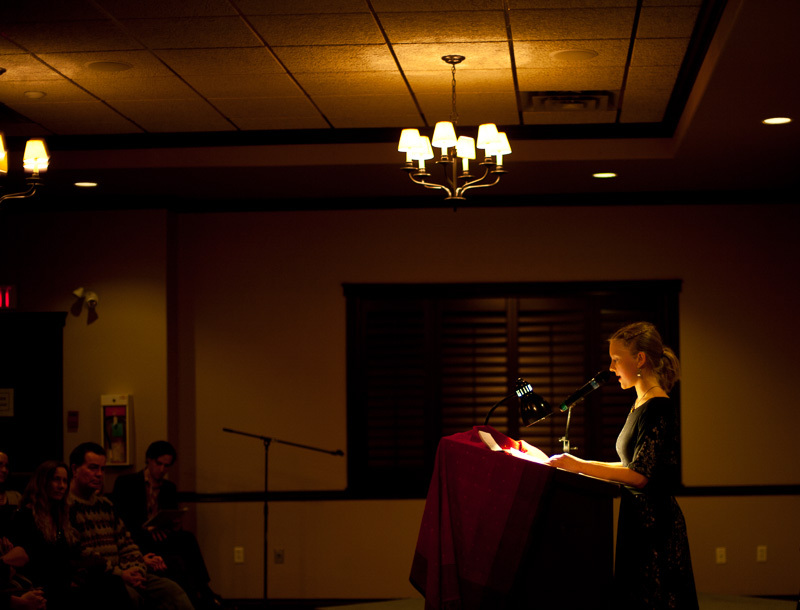 It really was a stellar success beyond my wildest expectations and it was really, really cool to see the spotlight shining so brightly on the oft-neglected literary arts and artists. All of my thanks have been done in person, or at the awards, or in the anthology, so if you’re reading this and feeling frowny-faced because I overlooked you, give yourself another pat on the back from me. -Ask your librarian about local authors they recommend. Buy their books. Write reviews for them on Amazon or Goodreads – or both! Talk about local authors you like on Facebook or Twitter. -Give works by local authors as gifts – there’s a good chance you can even get those books signed. 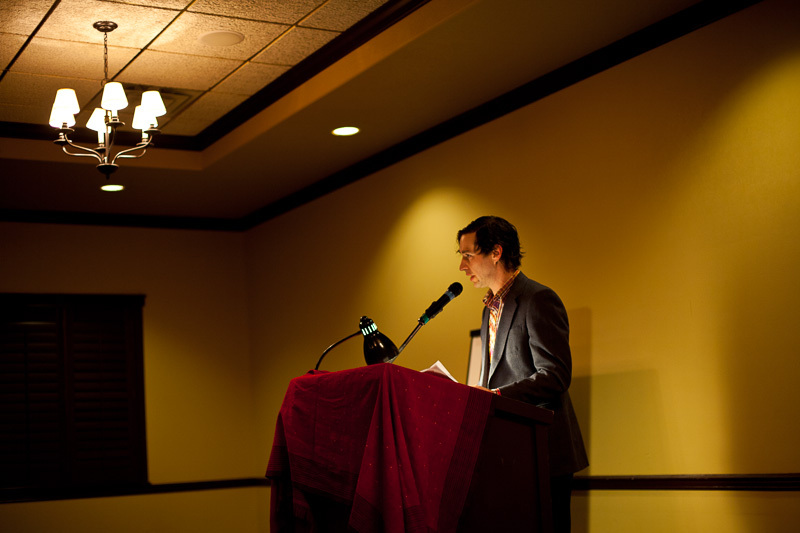 -Come on out to free literary events in your town. They can be pretty fun and you might even see a crazy woman with pink hair. Oh, and you could always purchase an ebook copy of the KLC 2012 Anthology Revolution – cover design by uber-talented teen wonder Liam Barnes! My time as a volunteer is over. I am literally burned out. Ah, the curse of the overachieving perfectionist. I need some time for sun, sand, fish tacos and fun time with Prez before I dive into the frenzy of publishing the second Warpworld novel (Wasteland Renegades, coming this spring but you can ‘like’ us on Facebook today!). But it was a terrific experience and I exceeded my quota of “cool people that I have met” for 2012 by leaps and bounds. Also, the committee gave me a parting gift that included six gourmet cupcakes. And you know how I feel about cupcakes. 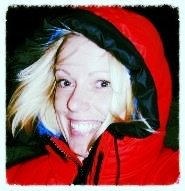 Until next time, and on the road south to Baja, may this find you healthy, happy & lovin’ life! 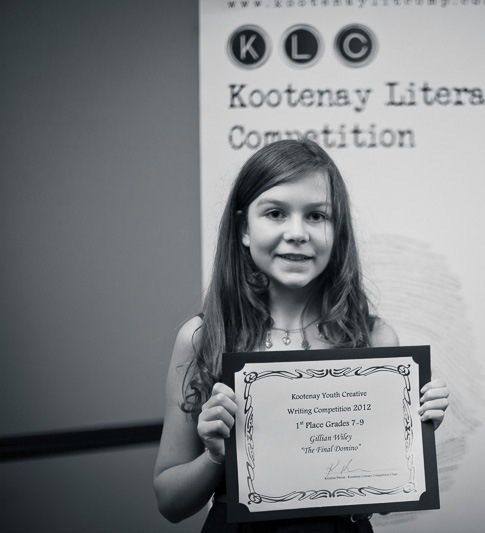 This entry was posted in Entertainment, Nelson - British Columbia, On Scribbling and tagged books, Can Lit, KLC anthology, Kootenay Literary Competition, Kristene Perron, Lucas Myers, Otter Books, Sheri-D Wilson, Warpworld. Bookmark the permalink. 4 Responses to Lit-tastic Awardsapalooza Extravaganarium 2012! Nice job! Oh, and I think I had that virus, or a nasty stomach bug of some sort. It was really epic. Anyway, get well soon! You nailed it! I was and still am the happiest person being selected to recieve such an honor! What an amazing evening! Always happy to put a smile on a writer’s face, Darcee. 🙂 Congrats again!